The Austin 3 Litre… We’ve all got opinions on this car but, let’s be honest, most of them aren’t exactly favourable. The swansong of the British Motor Corporation, launched in 1968, was a flagship car, aimed at discerning executives who valued comfort and luxury above all else. It was an interesting car, which was moving away from the fashion of the time. Since 1963, the Rover and Triumph 2000s had changed the face of the executive market in the UK. Their arrival on the scene had rendered full-sized cars such as the Humber Super Snipe and Vauxhall Cresta PB fairly irrelevant, as these smaller upstarts offered much of the performance and luxury of the traditional big hitters – and all of the status. Five years on, and it’s easy to see why the 3 Litre was seen as old hat when it was launched and that commercial failure was an inevitable result. At the time, it was priced well and offered a great deal of metal for the money. In 1970, you’d need £1770 to buy a new 3 Litre and that was pretty competitive when looking at the opposition. It was comparatively priced with the Citroën DS20, Ford Zodiac, Opel Commodore, Triumph 2.5 PI and Vauxhall Viscount, while the Jaguar XJ6 in manual 2.8-litre form was a little up the price scale at £1999. Austin 3 Litre: killed by plain looks or shared doors? I can’t help wondering, though, if the 3 Litre would have enjoyed a kinder fate had it been in a different place in BMC’s development schedule. As you’ll read in the Austin 3 Litre development story, the ADO61’s shape was all set in 1963, a year before the launch of the 1800. That had me thinking – what would have happened if the 3 Litre had been launched before the Austin and Morris 1800? Would you buy a family car that looks like the flagship? Think about that for a moment… In a stroke, the perceptions of both cars would have been changed. Being first on the market, the 3 Litre would not have been accused of sharing its doors with a more humble car and buyers wouldn’t have made the obvious comparisons when they saw the 3 Litre in their local dealer. And would the BMC 1800 have benefited too from the shuffle in the launch programme? More than likely… Imagine driving a family saloon that had a clear family resemblance with the flagship? Well, that seems to work for BMW and Mercedes-Benz. Back when launched the 3 Litre’s ride and handling was considered to be on par with about anything available (comfy big saloons anyway) – and it is dynamically quite good, if you take A to B times instead of pure acceleration, which indeed is not much to talk about. It looks like it would have made a good minicab (if minicabs had existed back then). There was a Wolseley variant as a well as a pretty Vanden Plas version with a different rear look. If launched in 1963 the car would have sold much better and lasted until 1972 when the market had changed so much. The 1800 still would have struggled. Primarily because family cars were sold to fleets, and Ford, Roots and Vauxhall had the market sewn up until the Morris Marina came along. No fleet manager was going to buy an 1800 and the private market for family cars was very small because the UK family man did not and does not have much disposable income. A Wolesley variant of the 3 Litre might have increased its appeal. I notice Keith says that the launch of the smaller Rover & Triumph 2000’s rendered the larger Humber Super Snipe and Cresta PB irrelevant. Does that include the Ford Zephyr & Zodiac too? I always considered them to be popular back then. Yes – especially after they dropped the ball big time with the evil-handling and over-bonneted Mark Fours. A friend of a friend had a Zephyr 4, and used to climb into the engine bay to service it – so much wasted room! Keith: So you think the 3 Litre “from certain angles…looks great”? Um, which angles are those then? Like lying drunk on the ground squinting through rose-tinted glasses perhaps? I like this car for some reason,even with them bloody doors. It may have benefitted sales of the 1800, but I reckon it would still very quickly have seemed out of date compared to the Rover and Triumph. About the time BMC was launching this car their Australian outpost was launching derivatives of the 1800 that looked very different yet still retained the 1800 cntral section and those doors. Perhaps if BMC had adopted a similar approach to the 3 litre and made it more visually different to the 1800 it would have faired better? Regardless, it was the range rationalistion after the formation of British Leyland that probably saw the 3 litre off anyway. The rear end is fine but I’ve never found the front to be totally pleasing. A prestige branding might have helped as well. I remember when this came out and at first sight it looked ungainly. However from the rear it looked good (better than the 1800) and balanced, the interior was superb, but when you got to the front end the huge cheap looking Austin grill and headlight placement was an utter disaster. But all Austin models of that period had the wide grill, though at least on the smaller brethren they looked better balanced. I worked for the Greater London Council in the early 70’s and I remember they had a fleet of these cars based at County Hall for the chief executives/councillors to travel around in, they all had registration numbers of GLC-number-J, I wonder if any of these survive today? Where there any hearse conversions? I know there were a few 1800’s were modified, so would the panels fit? Looking at the picture of the estate, it’s easy to imagine a hearse version, but I don’t know if any were built. Sorry, the link only works if you copy and paste into the address bar of your browser, I don’t know how to fix that. The Downton version looked like a winner. They should have adopted that engine. I don’t understand what is the problem with ‘them bloody doors’. The front of this car is a cross between Austin 1800 and Edsel Ford. It’s really ugly. Contemporary reports panned the self-levelling rear suspension. Apparently it has a clever mechanism to maintain whatever attitude the car has when you start the engine. So if you load the boot, or have lots of rear seat passengers, and then start the engine, the rear is way down, and the self-levelling carefully maintains this exact angle. So the only way round this is to start the engine and keep it running while loading. The duff engine is the cap on a woefully under-developed car. It could so easily have been so much better. It really does not matter if the car is technically good or not, as buyers in that era were still interested in what a car would look like on their driveway. I would rather have a Triumph or a Rover P6 on there, irrespective of whether there was a price differential or not. I do not believe that buyers have only recently become fickle! We’ve always been like that. It was launched at least 5 years too late. What might have been OK in 1963 was a fuddy-duddy anachronism in 1968, at which point Rover and Triumph had already changed the game and Jaguar was about to knock everybody’s socks off. Everything about this car was totally off the pace in ’68. Sad, because it had its good points. I always quite liked it – but then I like the Audax cars & the Hawk/Snipe series. Rip out the awful 80hp motor from the Hawk & drop in the Douvrin 2.2vi and it’d be perfect. The 3 litre would fit physically but you’d soon be spitting out chunks of gearbox. The 4 litre R based on this is an impressive beast & a car very well worth hunting down. If the 3 litre was going to the ball,who would be it’s ugly sister from the late 1960s? Think you’ll find the 4 litre R was developed from the Vanden Plas 3 litre, itself related to the “Farina” Austin Westminster that preceded the Austin 3 litre here. It has to be said it does miss something…maybe the engine. I have a A110 and that also misses that something. Whist smooth and quite for it’s day It is hardly a rapid highway eater. I get the same feeling about this car too. The larger engined Vauxhalls and Fords of the time were much mush more confident when pressed on a bit. @21 – I cant really see how a massive price hike could have helped this car – or any other for that matter. Actually take time to look at the price lists of mainstream brands like Ford and compare them with similar BMW models. The price gap isnt that big. Recently the web has been alive with people slating the new Audi A3 for just being an overpriced Golf. The actual difference in price between a Golf SE and an A3 SE? £250. It’s a shame the front end was so ugly as from the rear the 3 Litre resembles a limousine. Plus points, though, were a fantastic ride and excellent comfort, but the 3 Litre was let down by an engine that didn’t rev and guzzled petrol and also wasn’t that well equipped for the money. With the square light and round lights – was there meant to be an Austin and a Morris version @ the Princess eight years later? Really interesting idea although it was not that far behind the times, the Cresta/Viscount was launched in 1965 and the Zephyr/Zodiac in 1966, both discontinued in 1972 and not directly replaced. Perhaps the botched-up launch didn’t help with the car going to selected users for evaluation only and re-emerging with a revised specification. Sure they had minicabs then, our local firm had one Cresta but most of its cars were Victor FDs. They weren’t plastered with signs and plates or grim ‘no booking no ride’ notices then. The only way to tell them apart was the driver’s peaked hat and the Pye Westminster two-way radio. Maybe it would have helped – as a flagship car – to launch it as a Vanden Plas or Wolseley only? Can’t help thinking that selling it as an Austin kind of misses the point. @2 – spot on- it’s not in the same league as the XJ, on a reasonably flat road the Austin 3 litre rides beautifully and can fool you into thinking it’s a match – the almost complete and utter lack of damping means you do not feel little bumps and jolts. Now drive it fast on an undulating road and chuck a corner or change of direction into the equation and you soon find the car pitching and rolling uncontrollably – one corner on the bump stops – the other with a wheel fully extended – all of a sudden the car feels like there’s a hinge in the middle – terrible. The XJ would just effortlessly flow – like all good big cats do. The Wolseley and Vanden Plas 3-litre prototype should have been produced into place of the Austin 3-litre and built earlier, so they could received more modern looking Michelotti facelifts as in the following link (look for 24 April – ADO61 revisited). Or see the images themselves below. Part of the problem with the 3-Litre is that it was designed as a flagship model for BMC (more than likely with Wolseley and Van den Plas versions) however by the time it was launched BMC had merged with Jaguar and it was forced to find a position below the 420 and Mk2. Things were further complicated by the time it went into production as the XJ6 2.8 had just been launched and BMH had now merged with Leyland bringing the Rover P5 and P6 as well at the Triumph 2000 and new 2500Pi into the equation. In the new British Leyland range the 3-Litre was surplus to requirements from the moment production started and like the Princess and Rover SD1 that followed it was forced into a marketplace (with only an Austin badge) well below the one it was designed for. Although I don’t believe that it would have ever been a great seller, at least if it had been launched with a full range of models in 1966 or before it would have been able to achieve its full market potential. The 3-litre nearly looks good, perhaps if it wasn’t for those doors! Tragic that those doors are the worst feature of all three cars that share them. Quentin @ 28, what was the Victor FD like as a taxi? In the North East it was mostly Hillman Hunters in those days. ADO 61,another BMC/BLMC wasted opportunity. Made a bloody good banger, so strong they should of put a cannon on it and sold it as a tank. Downton did a conversion that got significantly more out of the engine, apparently transforming the character of the car. I can remember one being involved in a crash in Some Mothers Do Ave Em. It’s not the kind of car I’d like to be hit by as for all of its faults, it was built like a tank. If it had been styled by Michelotti and the engine was more powerful, this could have been a really good car. I think if the 3 Litre had been launched before the 1800, it would still have arrived in the market after the Rover / Triumph 2000 and so would have still looked out of date. One thought though is, would it have looked so out of date had it been launched with the 6 cylinder E series engine (2,0, 2,2 and 2.5) and or the Daimler V8 which was going spare from Jaguar instead of the heavy and thirsty C series. I see a 3-Litre around north London from time to time and I actually quite like it. The longer front/rear make it look more balanced than the shorter 1800. But the branding was all wrong for a flagship car – it should have been sold as a Wolseley and a Vanden Plas. I seem to remember the subsequent Wolseley 2200 being quite popular. To be fair to the C-Series, there were stillborn plans at reducing the weight by as much as 175lb with the potential to be tuned beyond 200 hp. Agree with you on using the E-Series 6-cylinder (though they’d need to uprate the power for ADO61) and the Daimler V8, yet how feasible would it have been to produce a lower capacity 3.0 Rover V8? maybe it should have been put with Jaguar….Powered Windows and extra trim above Triumph. Thinking back to the late 60s, there are surprisingly few direct rivals, as many of the volume manufacturers of that period had no executive cars in their range until the 70s, and especially no 6 cylinder models. Agree with you in part, but I think a Rover V8 was out of the question as I don’t think they could build enough. I remember my Grandfather ordered a Range Rover in 1970, and he did not get it till 72 and then it was the wrong colour, apparently one of the key reasons for the long waiting list was the limited volume of V8 engine production. I keep reading about this era about the lack of V8 engine production capacity, is it that hard to buy some more tooling to expand production, as this was a massive asset for the company that wasn’t being exploited properly! I’m also surprised that the demand for Rover V8’s was caused by limited supply yet some of BL’s engine plants were underused & some engines were created mostly to keep plants open. Was the V8 tooling too expensive to duplicate? I know it’s a more complicated engine to make than normal, with the alloy casting & steel liners. @49 and @ 50 The problem was the same as why they could not build more Range Rovers and XJ6. 2 The company was leaking cash, through a combination of strikes and the failure of the Maxi and 3 litre to sell and the 1100 / 1300 drop in sales through age and replacement in Morris dealers by the Marina. 3 Money being spent on engines to keep the Unions happy such as ar Canley, because the company wanted to avoid losing sales through more Strikes. It was astrike at Canley that was engineered to force Leyland into Nationalisation. 4 They did invest in extra capacity and new models, the new models unfortunatly were the Allegro and Princess that both failed to achieve sales targets. The extra capaciry at Jaguar arrived just in time for the fuel crisis and at Rover to build the SD1, which they didn’t do very well till the mk2 at Cowley. @49 @50 If you think it took a long time to sort out increasing V8 production, this was the same company that spent best part of two decades to build a 4 door Range Rover. Its a sign of the quality of the Range Rover and XJ6 /12 that they both survived the British Leyland years without any significant investment. @32 Good pictures but reading the link I think the Michelotti pictures are in fact of 1800’s. But makes one think given, these and the Apache, what could have been done in 68, if Michelotti had been given the job of sorting the Maxi out before launch. Then followed through with facelifts of the Mini, 1100/1300 and 1800 may have been money spent better than on the Marina, which did sell well, but in the process took a lot of sales which would have gone to the Morris 1100 and 1300 had it not been dropped to make way for the Marina in Morris dealers. The 3 Litre just wasn’t special enough for the money. Also it was let down by that cheap speedometer from the 1800, a lack of luxury touches like a radio( standard in many of its rivals) and a nasty looking gearstick. Also to clear some confusion up, was leather an option or standard? Re 52: The only reason the Range Rover survived was that outside of the US, it didn’t really have any competition. The “XJ6/12” didn’t survive…the XJ40 was designed and engineered before the split off of Jaguar. The problem was by the time it was launched BL did not want the car to be a success. It did not want an Austin/BMC product taking sales from Jaguar, Rover or Triumph. Launched in 63 and with a E6 engine 2lt – 3lt it could have made a real impact. After all the 1800 won car of the year at launch. GM originally stopped making the V8 because it was expensive to build, they replaced it with a very similar cast iron-V8 and V6 that were far cheaper to build. Maybe the idea of building another line to make expensive engines didn’t appeal, instead they tried a variety of cheaper more temperamental options. If anyone is interested in the unbelievably convoluted history of the Buick engines, Ate Up With Motor has it covered. @58 Interesting article- Only BL could buy the rights to an unloved, unreliable V8 motor and turn it into one of most reliable, dependable and cherished engines they ever built… whilst almost simultaneously developing its own V8 engine (Stag) which contained all the faults (and more) of the original Buick V8! The Wolseley front end looks superb to me. Agree that it was the only version they should have made. With the Rover V8 it would have been quite a car. Leyland did invest in extra V8 capacity, in Australia to build the 4.4 litre version for the P76 of 1973-74. They then scrapped the state of the art 25,000 unit pa V8 engine plant when they closed the Zetland plant. One can’t help but think of that lovely 4.4, or planned 4.9, slotting under the Range Rover and SD1 bonnets and alleviating the V8 supply problem! The main fault was Issigonis being involved. Ambla not leather. I understand that there is one in Canberra ACT, but these 2 are probably the only ones in Australia. I recall seeing one on a trip to the UK in the early 80’s. It’s a pity some minor work could not have been done to improve the looks. A slightly longer roof with blank rear quarters in the shape of a parallelogram would have done wonders. Of course it also needed some major work on the engineering and general construction quality to bring it up to scratch. I have read the comment on the Austin 3 Litre with interest as I bought one new in 1970 and ran it until I left the UK in 1986 – by which time it had done less than 25,000 miles as it was one of three cars in use by the family. Its main function was the family holiday which involved taking the hovercraft to France and then a long run west to St Anne la Palou stopping for one night at Domfront. It was perfect for that purpose. No great acceleration but a delight to drive and very comfortable for the children in the back. Luggage was unlimited and they could take all of the toys that they wished – unlike the Triumph 1300 we had previously in which even the dish of the spare wheel had to be used for storage. We fitted yellow headlamp adaptors made by Lucas to all four headlamps but they were not effective and nearly all French drivers flashed us and undipped their lights which made a night drive difficult. We had many adventures with “Felicity” but overall she was very reliable and a safe car to drive with excellent visibility and effective brakes, she was also very quiet apart from some wind noise. The rear suspension jacks have been mentioned. The idea was to level out the ride when the huge boot was fully loaded but one jack used to stick from time to time and the car would then assume a crazy cocked up angle like a dog at a lamp post. I had this happen several times and quite often saw other 3 Litres suffering a similar problem. The BMC dealer fiddled with the set up several times but eventually he received instructions from BMC to disconnect the jacks as no cure could be found. I never noticed any serious difference after they were disconnected. Petrol consumption was terrible. 18 mpg has been mentioned and that might have been possible on a long steady run, but in London it was more like 10. Tyre wear was a problem despite constant checking of the tracking and I spent a fortune on tyres. Our car suffered overheating from new. This was only at slow speeds in traffic but made visits to London a nightmare as the car would stall at lights and one had to go into neutral with the automatic box before the engine could be restarted. We had the radiator flushed, new thermostats etc, but the problem was never solved. Excellent, it’s good to hear from someone who actually ran one of these beasts. I like them, the shape always looked like a more balanced design than the 1800 with its abruptly truncated rear end with minimal overhang. The Austin 3-Litre lives on in my stories and a character for a time actually owned one. One last gasp at a top of the range Austin and a car that seemed doomed from the start, as its very low sales total and short life confirm. Yet imagine if the 3 litre engine was fitted into the Landcrab with some performance improvements and sold as an MG. This really would have been interesting. Might have been workable had the Landcrab remained RWD as on earlier prototypes and drew more from Issigonis’s work at Alvis. Add 2.0 B-Series along with 2.4+ E6 and significantly lightened 3-litre C-Series engines and BMC would have roughly anticipated the mk3 Ford Cortina. 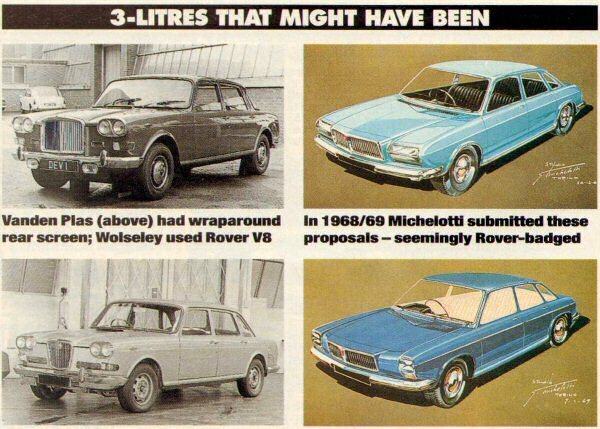 Doubt it was possible to even fit a 3-litre C-Series into a RWD Landcrab (despite reading of a FWD prototype with a Rover V8), maybe in a RWD version of the larger Victor/Granada-sized Landcrab-based X6 would have allowed for a 3-litre C-Series (and even daresay the Rover V8) to be successfully installed. Has a quiet elegance to my eye and a well sorted minter I’ve seen online can be had for 10k. It’s certainly aged well, though the engine looks lost under all that bonnett and it’s hardly well appointed by even the standards of the day if it was a luxury motor although the seats look large and comfortable. I’d buy one tomorrow though I’d probably need a new wife afterwards. Great to see so many people offer passionate opinion on a car that was a flop! However, I totally agree with Keith’s hypothesis. If the 3 Litre was introduced first, and earlier, and before the 1800, I believe it would have been viewed in a totally different light. Earlier release would have made it much more acceptable as large cars were still respected at that time. It should have been named Austin Westminster – this name already had cachet and mild prestige. It would also give continuity to the Westminster name. The car should also have been released as a Wolesley (more upmarket) and top of the range as a Vanden Plas. The success formula already existed in the previous Farina cars and even in the 1100/1300 range! The Auto version had an attractive selector that suited the rather large transmission intrusion. Introduced a few years earlier, with some more attention to detail, it may have been a much better and more acceptable large-car proposition, as Keith has suggested. To be honest along with appearing earlier perhaps the 3-litre / ADO61 would have benefited from somewhat like Gerald Palmer being involved as opposed to Issigonis who was simply uninterested in this type of car? 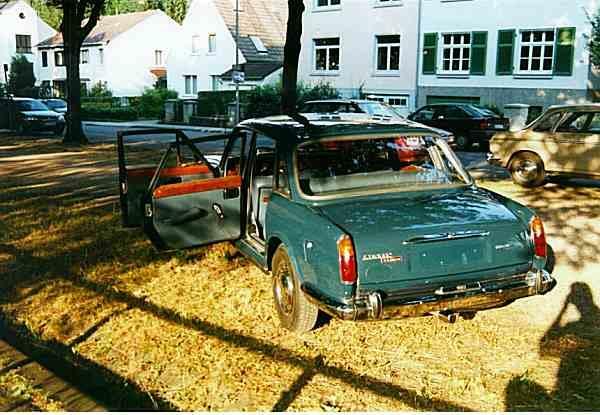 At the same time am convinced a RWD X6 was the best approach to take as a direct rival to the Rover P6 and Triumph 2000/2500, given the fact the original ADO17 / X6 prototype was not only RWD but also drew much from Issigonis’s work at Alvis with the TA/350 V8. Basically a RWD X6 could have been an indirect production viable successor to the Alvis TA/350 V8 in Vanden Plas form, powered by either 2-litre+ B/B-OHC(or limited-run reliable B-Series Twin-Cam) 4/6-cylinder, 2-litre+ EA827-like E-Series 4/6-cylinder or 2-litre+ narrow-angle V4/V6 engines. The 3-litre / ADO61 OTOH was more similar to the Rover P5 though could have still worked had it been produced under the Vanden Plas badge and simply received a properly-developed (plus OHC / Twin-Cam) C-Series that met its weight reduction targets (or failing that a few of the alternatives mentioned above). After the failure of the Austin 3 Litre, British Leyland wisely left the big engined luxury car market to Jaguar and Rover. However, the Wolseley Six, with its smooth and powerful E6 engine and Jaguar like interior, proved to be fairly successful as the flagship of the ADO17 range, which showed that there was a market for an ex BMC luxury car, so long as it wasn’t too large and basic for the money like the 3 Litre. Also the E6, unlike the C series, had a nine year lifespan and was regarded as a decent engine. Nate what makes you think that the X6 prototype was RWD?. It wasn’t yet the initial ADO17 prototype was RWD, since the ADO17 (after being converted to FWD) later beget X6 it provides some insight as to how BMC could have developed a proper RWD rival to the Rover P6 and Triumph 2000/2500 without necessarily needing the 3-litre / ADO61. I’ve never been able to make out what the 3 litre was all about. With Wolseley or Vanden Plas branding it might have done better, but it seemed doomed as soon as British Leyland was formed, if not before. Same doors an 1800 eh, ha ha I’d like to see somebody try to fit 1800 doors to a 3 Litre. Morrie the V8 machinery together with the E4/E6 went over to South Africa after the Zetland closure. What I found funny was the Aussies took the 1800 and made the Kimberly/Tasmin but said FWD did not cut it down under and needed RWD when developing the P76, while in the UK we got a RWD Austin that looked more like something from the 1950s when the Aussies had designed something that looked contemporary! I think this story gives us the whole picture of the UK car industry – piss poor management, underdeveloped cars which miss the market and terrible marketing and planning. It’s a shame cos my Great Uncle loved his 3 litre and only traded it in for a Maxi because of the fuel crisis. If the car had a better engine and been styled as per the Tasmin, and badged as a Wolsely or Vanden Plas it may have sold a lot better. Not sure if Keith’s assumption that if the 3 litre had been launched first, it and the 1800 sales would have been better. My father had 6 of these on the trot as company cars. Excellent to ride in as a kid and a real quality feel. He reckoned they were streets ahead of his previous Wolseley 6/110s. Upholstery was Ambla with no leather option. The first one hundred (test subject) cars did have leather and a slightly different interior.